TechCorro™ [F] VCI bubble films can be manufactured in a range of bubble sizes and specifications. 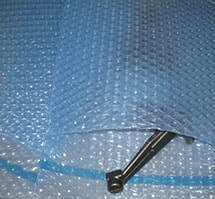 The bubble film is produced with VCI on one or both sides. It is available in rolls, sheets (perforated on a roll if required), tubes and bags. Bags can have a self-seal feature. Ideal for use where the item requires both mechanical and corrosion protection. The VCI technology provides corrosion protection for a wide range of metals. As with most films they can be coloured and printed to suit special requirements.